Volume: 50 liter maximum operating batch size with 6" extra free board. can operate until vessel is completely empty). Dimensions: 16" inside diameter with 2" deep ASME dished bottom head and 22" straight side. Finish: #4 finish on all interior and exterior surfaces. All welds ground smooth and flush. Bottom Outlet: 1-1/2" diameter flush bottom ball valve with 1" dia. tri-clamp style fitting 15"
from bottom of valve to floor. Hinged cover on operator side. 1. 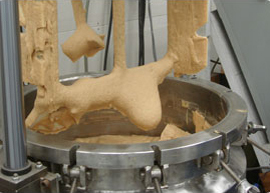 High shear homogenization, dispersion, and emulsification. 2. Positive incorporation and wet out of floating solid powders. 3. Scraped surface agitation of heat transfer surfaces during heating and cooling. 4. Positive radial rotation of batch throughout high viscosity range. 5. 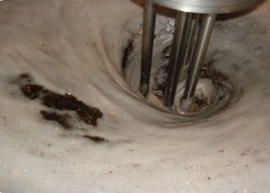 Deaeration via axial flow to surface level baffle plate. 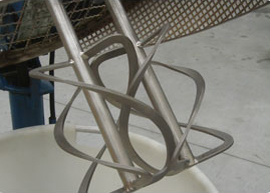 Configuration: Tubular anchor with one lower cross support on 4" diameter drive. 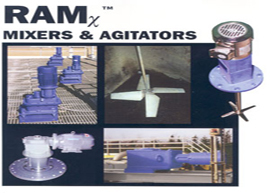 in steam heat transfer service. 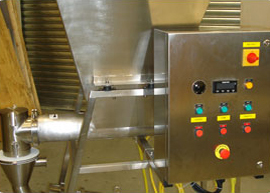 High velocity flow mixer for dispersion of stabilizers such as carbopol, xanthan gum, CMC, pregel starch and other thickeners. Unique “DOWN MODE” operation is able to quickly draw in and wet out powders from the surface. 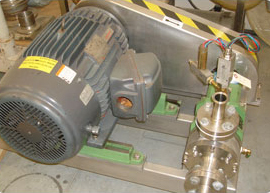 By reversing to the “UP MODE”, the highest flow rate and shear rate can be exerted while eliminating air incorporation. By adjusting the baffle plate level, fine grain emulsions with droplet size distributions in the single micron area are possible. 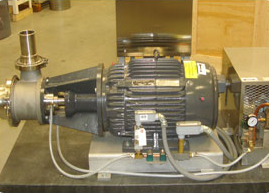 Power package: 0.75 HP, 10,000 RPM, 120 volt, 1 phase, 60 Hz, TEFC motor. Requires motor starter or invertor - not included in this proposal. Drive: Direct coupled with stainless seal shaft couplings. Shipment: 10-12 weeks following receipt of down payment. Drawings for approval submitted 3 weeks after receipt of down payment. Drawings must be returned APPROVED in one week or shipment date will be delayed.